Audio aid are important in classroom, it has been in use in education system for long time. Audio aids are the best tool for making teaching –learning process more effective. Because it help student to become more attentive and can generates more student participation in the class and a positive sign of interest for the lessons. Audio aids provide the student with pragmatic experience, which catch their mind and help in the understanding of the lesson easily. Online group discussion using audio tools can help two or more student to participate or live conference call. This kind of participation in audio conversation is very effective in distance learning. Class lectures can be recorded and shared as a study resource through online which is accessible to all student are important because with them learners have a clear view of what is being taught. Foreign language student can get benefit from audio recording material as they can be good quality source of Information, Teacher can use audio extracts as a part of their teaching activity. Instead of written assignment feedback if as a voice recording feedback by teacher that are sent to student as a mode of feedback for their assignment work. 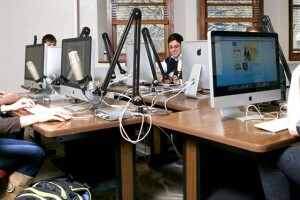 Audio-conferencing tools enable student to talk to one another in real time over the Internet. Audio tools allow learners to practise their speaking online in pairs or small groups. Audio aids can be best utilize for speaking exchange to allow learners to come into contact with native speakers of the language they are learning. If the native speakers are also learning the same language, The benefits for both groups could be correlative, with approximately half the time devoted to the language they are learning and the other half to the language the others are studying. Actuality and commentary use of Audio for History and Geography subject – Material recorded on different places and designed to convey a sense of place and atmosphere. Very useful for giving students the vicarious experience of field trips and visits to places of interest and relevance to what they’re studying.